The Events Upcoming module is a great module for you to use on your website if you would like to display the upcoming events from a specific Calendar module. This module has a more compact view, so you can fit this in smaller areas of the site, but still has a great look, and a great informational source. This module will display the event name, date, and time of when it will begin. The events will also be color coded according to how you have made them within the corresponding calendar module. First, make sure you have created this module by navigating to your admin panel > modules tab. Once there, scroll down to the "Events Upcoming" module, and create. Within this module's editor, you will have the options to set which calendar module you will be taking the information from. If you have none, please go back to your admin panel > modules and create an "Events Calendar" module and create some events! 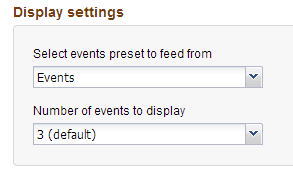 You will also have the option to set how many upcoming events you want to display within this module. 3 being the default.